"We'll deal with him later." -- Clinton co-chair Rep. Stephanie Tubbs Jones, on Mark Penn. "It's disgusting for him to do this . . . that's just disgusting." -- Clinton supporter Hilary Rosen. Mark Penn sleeps with the fishes. Metaphorically speaking only, of course. On this evening's Tucker, Clinton's chief campaign strategist came in for some industrial-strength opprobrium from two prominent members of Team Hillary for his attempt to flee what might be a sinking ship. Penn said in an e-mail over the weekend that he had "no direct authority in the campaign," describing himself as merely "an outside message advisor with no campaign staff reporting to me." "I have had no say or involvement in four key areas -- the financial budget and resource allocation, political or organizational sides. Those were the responsibility of Patti Solis Doyle, Harold Ickes and Mike Henry, and they met separately on all matters relating to those areas." First up was the ever-smiling Stephanie Tubbs Jones, congresswoman from Ohio and Clinton campaign co-chair. TUCKER CARLSON: Mark Penn, the chief strategist of the Clinton campaign, quoted as you know today in the LA Times saying basically "yeah, there's this Clinton campaign. Don't know too much about it. Not that involved in it." Here's a guy that took $10 million from the campaign you're co-chairing and now he's distancing himself from that campaign before it's even over. Why is he still working there? STEPHANIE TUBBS JONES: You know what? That's not my decision to make. 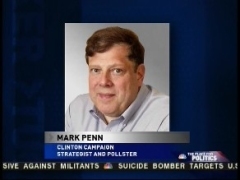 Mark Penn was hired by Hillary Clinton and the people early on in the campaign. I'm doing my job; I'm not worried about Mark Penn. We'll deal with him later. CARLSON [laughing]: I bet you will! Congresswoman, I appreciate your coming on; thank you very much. TUBBS JONES: It's always good to be with you. Happy to be back. CARLSON: Good luck with dealing with Mark Penn later. Who-o-o-o-h! I love the, the ominousness of that. A bit later, Tucker chatted with Jeanne Cummings of Politico.com and Clinton endorser Hilary Rosen. After Carlson and Cummings agreed that this was very bad form on Penn's part, Rosen unloaded. HILARY ROSEN: You know, short of Bill Clinton there was no bigger foot in that campaign. CARLSON: Thank you for saying that. CARLSON: That's right; we didn't imagine that, did we, no? CARLSON: All of a sudden, yeah! ROSEN: And I think most people on her team would say, actually, everybody's getting along better. Over the last couple of weeks people are looking at more strategy and people are feeling, and Hillary herself is feeling most optimistic: that's just disgusting. CARLSON: Thank you for being, I mean this, thank you for being so honest about that. Sometimes in current campaigns it's like you live in this parallel universe where nothing that is obviously true is actually true, and no one admits it, and thank you, I mean, that comports with everything I've heard. Recapping: Camp Clinton finds Mark Penn "disgusting" and will "deal with him later." Sweet dreams!